As part of the 244th Mountain Tank Battalion in Bavaria, Hauptmann Kurt Mohr and the men of 2nd Company are assigned with the rest of 1st Mountain Division to defend the border near Czechoslovakia. They set up in prepared positions to the north of a town called Grafling that lies along Route 11, a highway that leads south towards Deggendorf where a crucial bridge spans the Danube River. If the Warsaw Pact gets enough units across the river, II Corps will be forced to pull back west throughout Bavaria. Mohr's job is to delay the oncoming Czechoslovakians by destroying as many enemy tanks as possible before he and his men withdraw south through Deggendorf and then blow the remaining bridge. To get the job done, Mohr has three platoons of three tanks each and a platoon of panzergrenadiers led by the irascible Oberleutnant Muller. The battalion commander, Oberst Donner, has generously provided some scouts and a pair of Jaguar tanks - but he has made it clear that he expects results. But all is not well in Mohr's company. He's at loggerheads with Oberleutnant Schmitt - the hotheaded leader of Alpha platoon. As a newcomer to the brigade, he has yet to prove his worth to the men under him. On the other hand, the men in the company have been coddled by the previous commander and lack discipline. Mohr is a fresh graduate of the Armor School at Munster, unsure of his own ability to handle all the pressure of a real combat situation. The scenario I've designed here has some special rules to take into account the situation that Mohr faces at the start of the book. It also uses some of the older equipment from MBT to represent the Czechoslovakian forces. Of course it's not an exact match but some of the units are a close approximation. The Czechoslovakian 19th Motor Rifle Division leads the Warsaw Pact advance into West Germany. Its task is to advance west over the border into Bavaria and seize a crossing point over the Danube River. Follow-on Soviet and Czechoslovakian forces will provide a second echelon with the objective of advancing west along Route 92 and seizing Landshut by the end of the first day of the war. As the 8th Guards Army hits the US VII Corps, the Czechoslovakian 1st Army will have the vital task of pushing back West German II Corps far enough to allow for a flanking attack on the Americans. When determining the Initiative, The FRG force applies a +20 DRM. Ammo Limits are in effect. The FRG may employ up to 6 Hidden Unit markers. 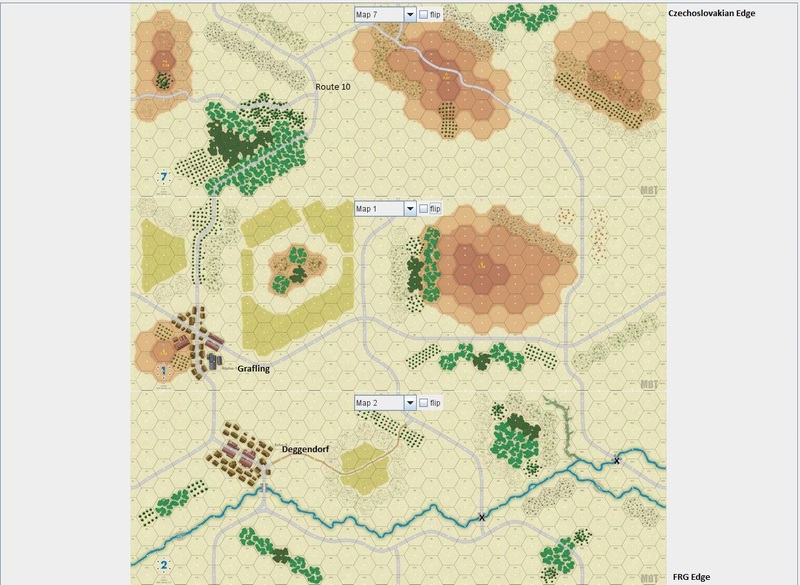 The command span for the FRG is 9 hexes. The command span for the Czechoslovakians is 5 hexes. The FRG force may apply Quickdraw. The FRG may use one leader to represent Mohr (use Vogel or Wolff) if Leaders are used. Put one of each command in an opaque cup (Short Halt, Move, Fire, Overwatch, N/C). Draw a random command marker when assigning a shared command to a designated tank platoon. This represents Mohr's personal problems with Schmitt carrying over into a combat situation. Ignore the two bridges in V7 and DD4 on Map 2. Conditions: Normal visibility. No adverse terrain. FRG - Force sets up first anywhere on maps 7 and map 1 at least 3 hexes from the Czechoslovakian edge. Two combat units may be placed Hull Down. Czechoslovakian - Enters the mapboard on Turn 1 anywhere along the Czechoslovakian edge. Units may be delayed for entry on subsequent turn at the player's discretion but all units must have entered play by Turn 5. Unit VPs - To the FRG Force for each operational Czechoslovakian unit that fails to exit from the FRG Edge. Unit VPs - To the Czechoslovakian Force for up to the first 14 units that exit from the FRG Edge. You can download a copy of the scenario in PDF format here. Have fun! 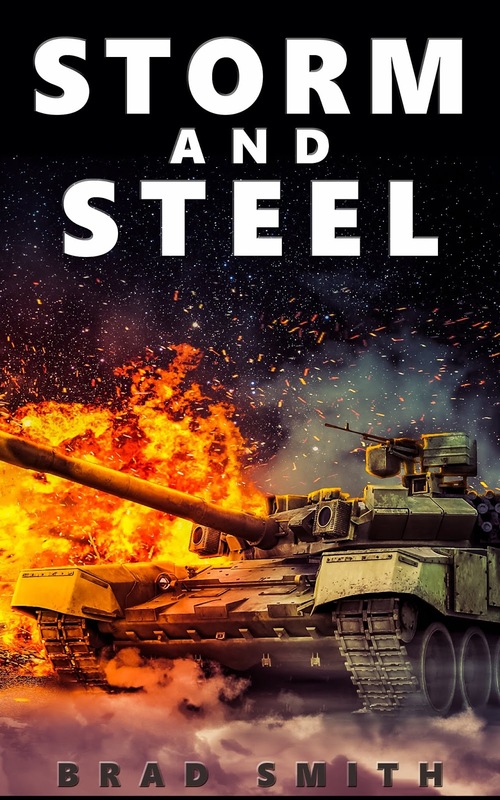 If you're interested in reading "Storm and Steel", you can get your copy here. Nice, Brad. It looks like a nice scenario. I probably should buy the book, too. You've published several books now on a fictional WW3, correct? I assume Storm and Steel is the one to start with. Hi Ken! Good to hear from you! You're right - I've been at it quite a while now; the series is somewhere around ten books at this point. Each book is a little microcosm of the war with different characters and plots that stand alone, so you can start with any of them. Storm and Steel is one of the better ones I've written though. Thanks for the background on the books. I will check them out in the future. My book backlog is pretty big at the moment. I need to play some more games, too. Next up is continuing to learn MBT. Trying to figure out which advanced and optional rules to use. Hey, no problem! I'm in the same boat with my books too and trying to manage it all with a three year old to boot! Good to hear from you. I just picked up the FRG expansion from the GMT sale, so I'll get a chance to play this one fairly soon. Good job!